Like an awkward teenager maturing into adulthood, Corsair is now almost unrecognisable from the DRAM specialist it was five years ago. First adding power supplies to its roster of products and following up with SSDs, cases, coolers, speakers and headsets, it’s expanded its product range enormously. In fact, apart from the CPU, motherboard and graphics card, it’s now possible to build a whole gaming PC from Corsair parts; something few other manufacturers can claim. The latest addition is a whole new line of Vengeance-branded gaming peripherals including, for the first time, Corsair keyboards. While Corsair might be new to the keyboard market, it's aiming high. Despite its £100 price tag, the Corsair Vengeance K60 is the cheaper of the two in the new range, with the MMO-targeted Corsair Vengeance K90 costing around £20 more. Despite this price tag, the K60 displays almost none of the ‘gamer’ features we’ve come to associate with high-end keyboards. There are no banks of macro keys, no LCDs, no key backlighting and definitely no mini fans to cool your hands. Instead, Corsair has focused on the basics, equipping the K60 with bomb-proof build quality and straightforward features that are genuinely useful. 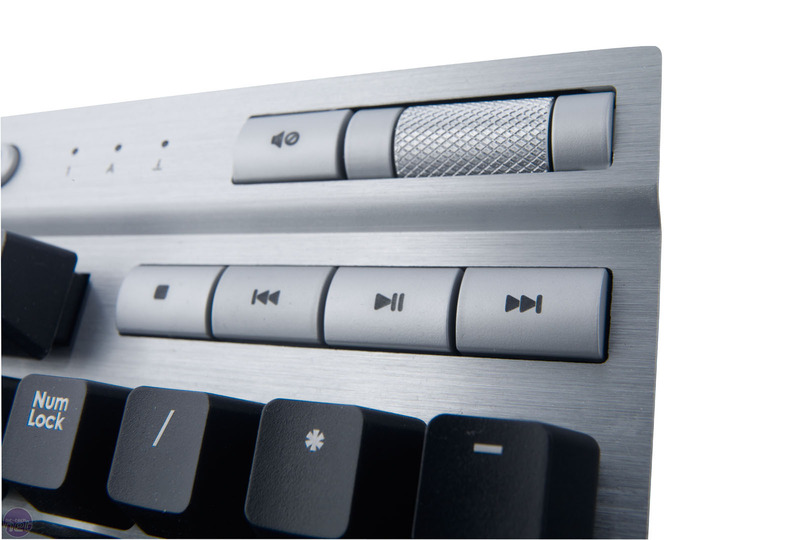 The most notable part of this is the K60’s gorgeous brushed aluminium chassis. The top of the keyboard's chassis is made from a single, 2mm-thick milled piece, indented to accommodate the banks of keys. This means the K60 manages to remain understated and attractive while also feeling tougher than Judge Dredd’s chin [Surely Dredd himself is tough, but his actual chin is hard? - Ed]. 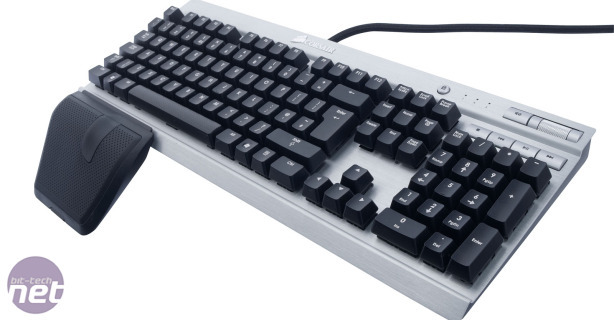 As a premium keyboard, the K60 also sports Cherry MX mechanical keys, opting for the Cherry MX Red variety. These keys have a smooth, non-tactile movement when pressed and have a lighter actuation force than the Cherry MX Black or Blue keys used in other mechanical keyboards. They also lack any audible click when the actuation point is reached at roughly half-way depressed. 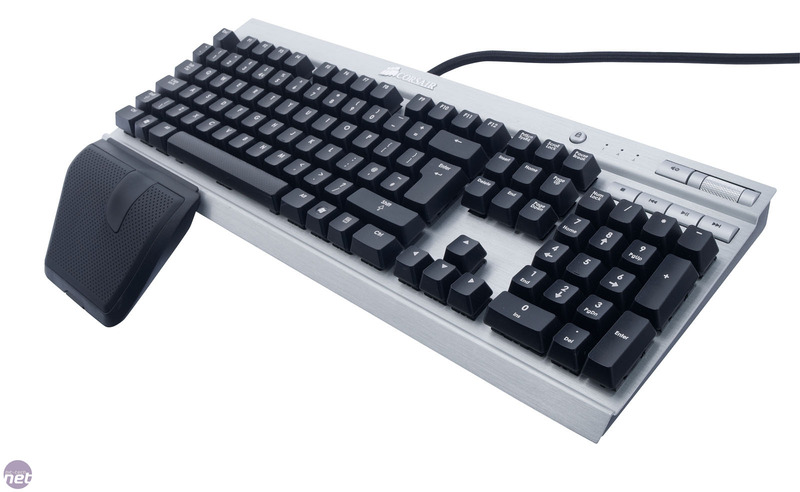 The result is a keyboard that’s just fantastic for playing games. Key presses are silky smooth without any of the stiffness or stickiness membrane keys can exhibit. Even the task of mastering BF3’s jets was possible, with the smooth and responsive keys enabling us to dog-fight with the best. Oddly though, not every key on the K60 sports the delightful Cherry MX Red keys. 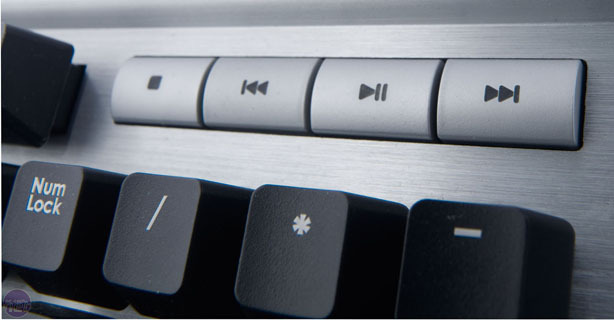 The Escape key, F-keys and page navigation keys are conventional membrane keys, although Corsair claims to have balanced them to share actuation force with the rest of the keyboard. The difference between the feel of the two types of key can be a little jarring, especially if a game makes significant use of the F-keys, or if you’re constantly reaching for the Escape key to restart a level.